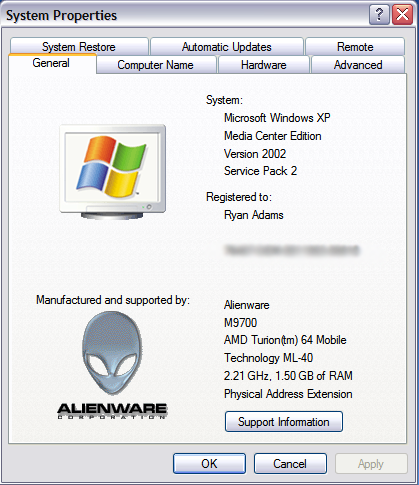 When you first install Windows XP or Vista you are asked to enter the name owner of the computer and the organization it is associated with. Sometimes you need to change this information (particuallry if Windows came preinstalled on your computer and the registered owner is something like “Dell Customer”). …and is also used as the default “owner” when installing new programs. Open the run dialog box from the Start menu. Type in “regedit” and press enter. When the registry editor opens, open HKEY_LOCAL_MACHINE\ SOFTWARE\ Microsoft\ Windows NT\ CurrentVersion. You will see keys listed for RegisteredOrganization, RegisteredOwner, ans ProductId. Double click on the item you want to change.